Home / Sports / SPORTS: Pogba Faces Six Weeks Out Due To Injury. The France international, 24, had scans on the injury on Wednesday. It is understood Pogba will miss at least a month, leaving him struggling to be fit for the Premier League trip to Liverpool on 14 October. United boss Jose Mourinho will give an update at a news conference on Friday. 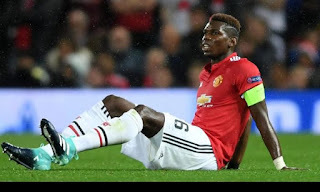 Pogba will miss league games against Everton, Southampton and Crystal Palace, next Wednesday’s League Cup third-round tie with Burton and the Champions League trip to CSKA Moscow on 27 September. He will also miss France’s World Cup qualifiers against Bulgaria and Belarus in early October, which they need to win to guarantee their place in Russia next summer.